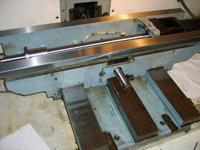 Here we have a picture of a box ways of a Fadel CNC Mill in the process of rebuilding. In the process we re-scrape the bottom of the saddle flat to the base ways, which are harden box ways. 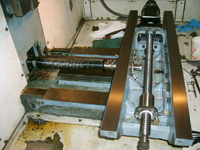 Harden box ways must be flat and align true, if the box ways are properly aligned to a new machines tolerances, the machine will operate faster and with less friction and in turn less maintenance will need to be preformed.